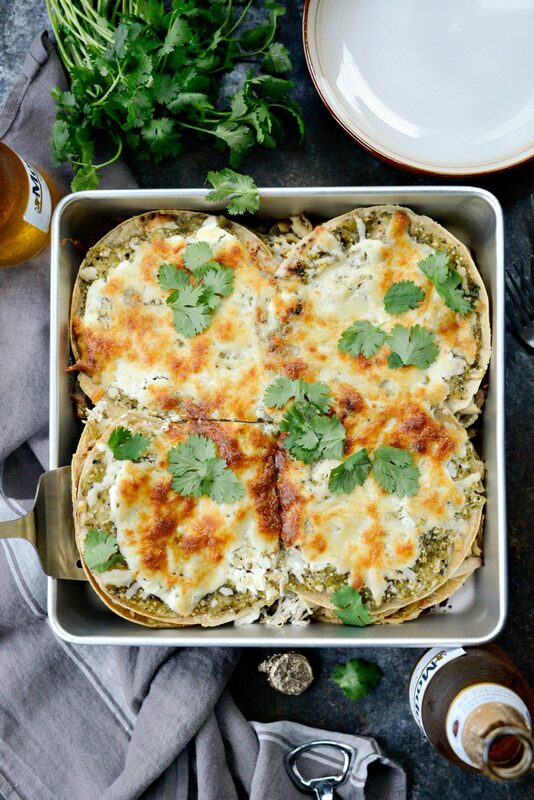 This Salsa Verde Chicken Tortilla Casserole has layers of pan toasted corn tortillas, shredded poached chicken, Monterey Jack cheese and a homemade salsa verde, all bake until hot and bubbly brown. When I make this, my house literally smells like a Mexican restaurant. I love it. Maybe it’s the fresh tortillas I buy and have to cook and toast in a skillet, creating this amazing toasted corn aroma through out the house? It’s mouthwateringly delicious. 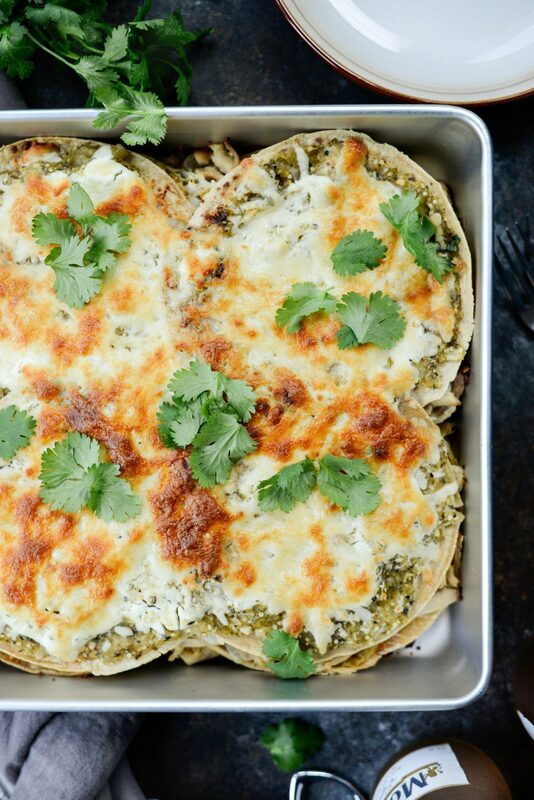 So this casserole is all kinds of yum. And can be made [mostly] from scratch with homemade salsa verde, left over shredded roasted or poached chicken — which is what I did. I don’t make tortillas or cheese from scratch. 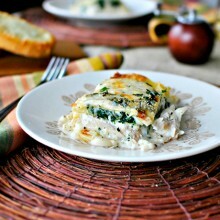 This casserole was so simple to throw together and was utterly delicious, not to mention it smelled heavenly. As things layered with cheese normally do. 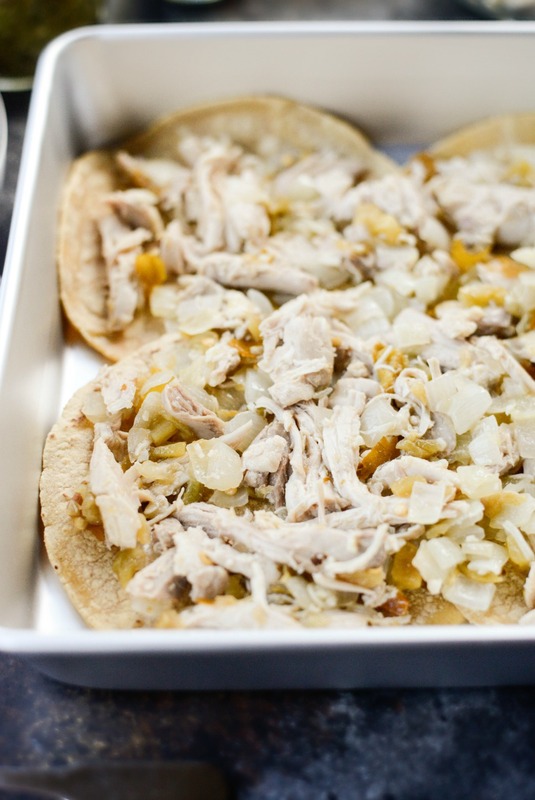 You will need 12 yellow corn tortillas. I bought fresh tortillas that are raw and need to be cooked in a skillet. I prefer this as they taste infinitely better and only take about 40 to 60 seconds. Once the tortilla is cooked, I leave it in the skillet a smidgen longer to toast. 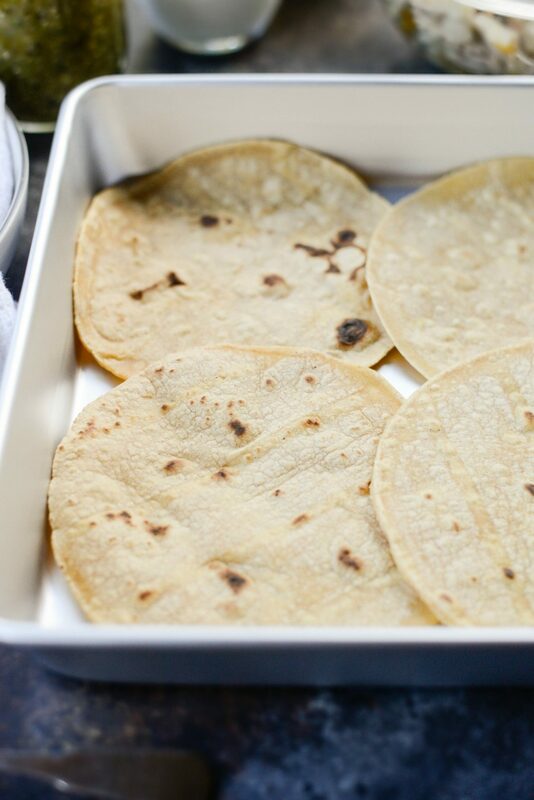 If using already cooked tortillas, you’ll need to toast them still. Though I highly, highly suggest purchasing fresh tortillas. 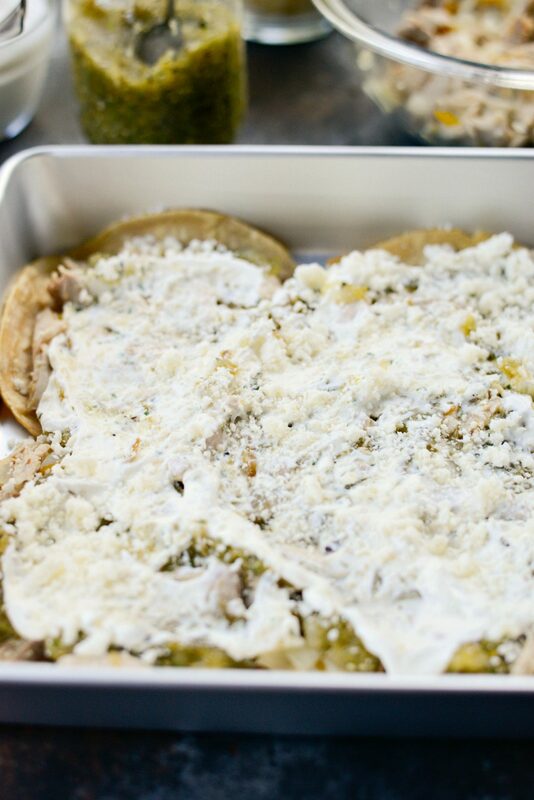 You will also need; shredded cooked chicken, 1 small yellow onion, 1 clove garlic, salsa verde, diced green chiles, sour cream, crumbled cotija and shredded Monterey Jack cheese. Sauté 1 cup of diced yellow onion in olive oil until tender, then add in the one clove [finely minced] garlic and cooked for 1 to 2 minutes. 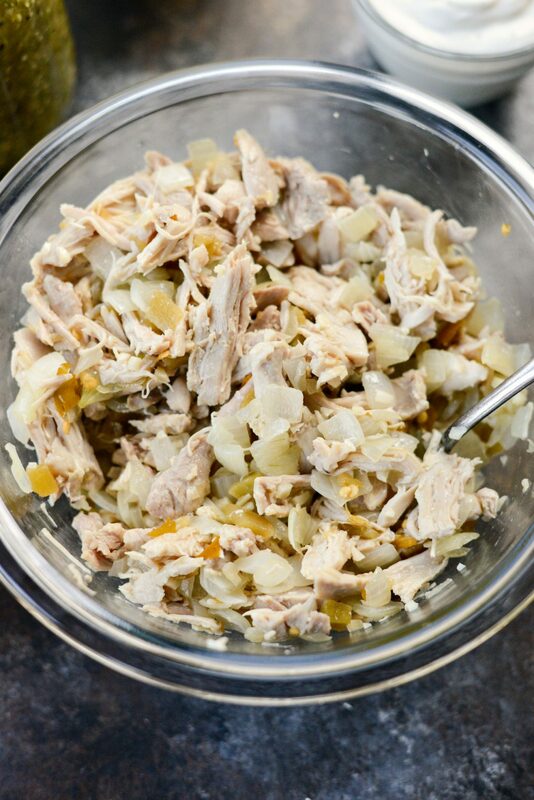 Then add the cooked onion mixture and 4 ounces diced green chiles into a bowl with the shredded cooked chicken. Toss to combine. 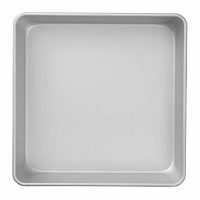 In a 10×2 metal baking pan [affiliate], arrange 4 of the toasted corn tortillas. 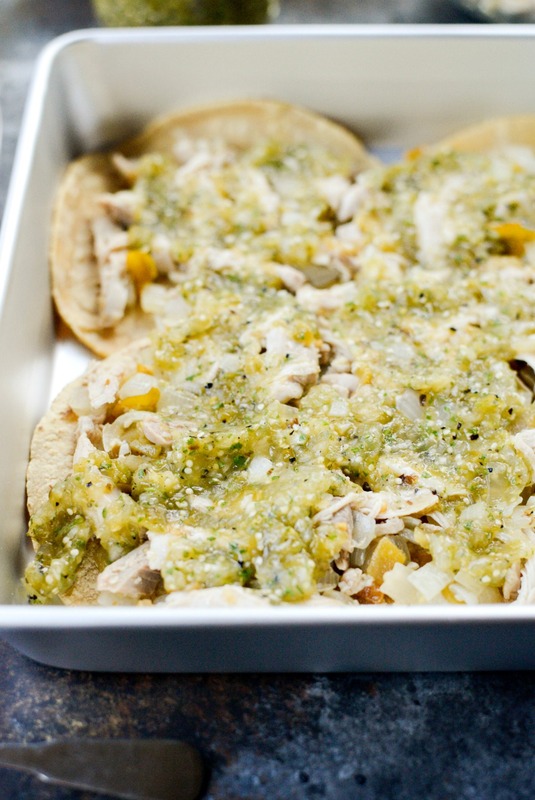 Top with 1/2 of the chicken mixture and spread a 1/2 cup of the salsa verde over top. Then spread 1/3 cup of sour cream over top of the salsa. Next, sprinkle with 2 tablespoons crumbled cotija and 1/2 cup of the Monterey Jack cheese. 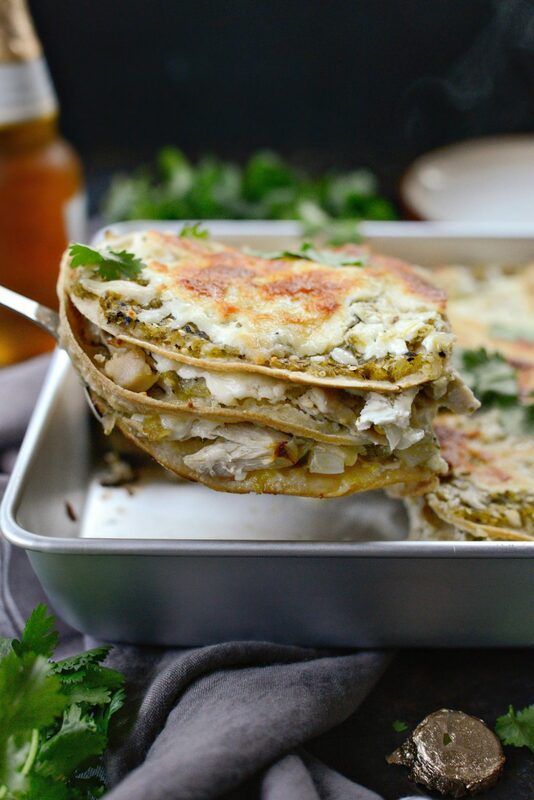 Then repeat a second time; 4 toasted tortillas, the rest of the chicken mixture, 1/2 cup salsa verde, 1/3 cup sour cream, 2 tablespoons cotija and 1/2 cup of Monterey Jack cheese. Top with the last 4 tortillas and the remaining 1/2 cup of salsa and 1/3 cup of sour cream. 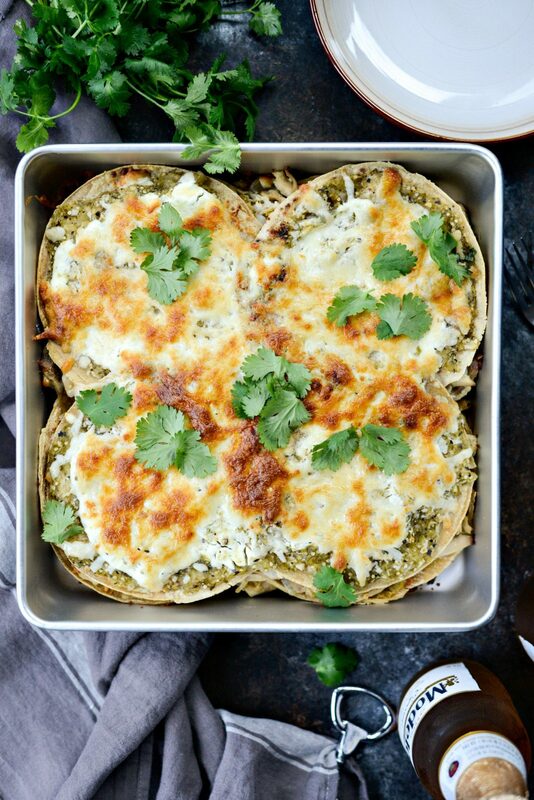 Top with the last 2 tablespoons of cotija and cup of Monterey Jack. 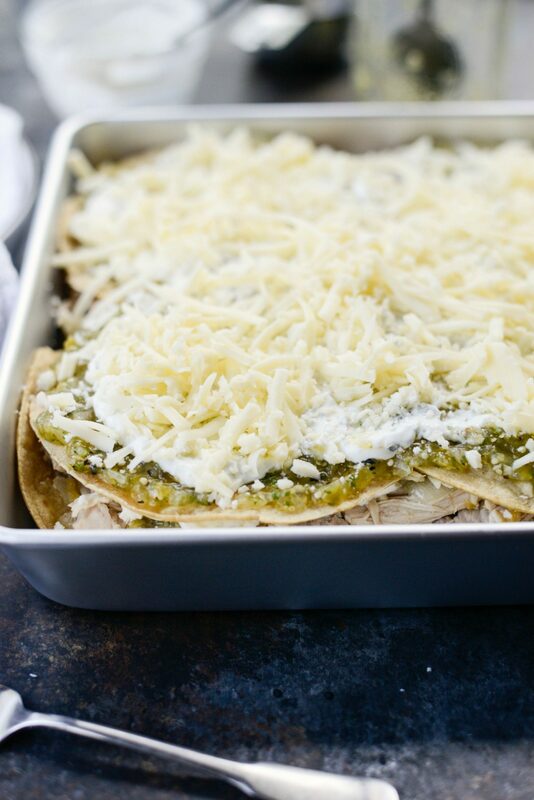 Slide the whole pan into your preheated 350° oven to bake for 30 to 40 minutes, or until the salsa verde chicken tortilla casserole is bubbling and the cheese is golden brown. This could feed four or 3 small portions if you are having some sides like refried beans and rice. Otherwise 4 generous portions is perfect. I just sprinkle with a little fresh cilantro and serve it with hot sauce. 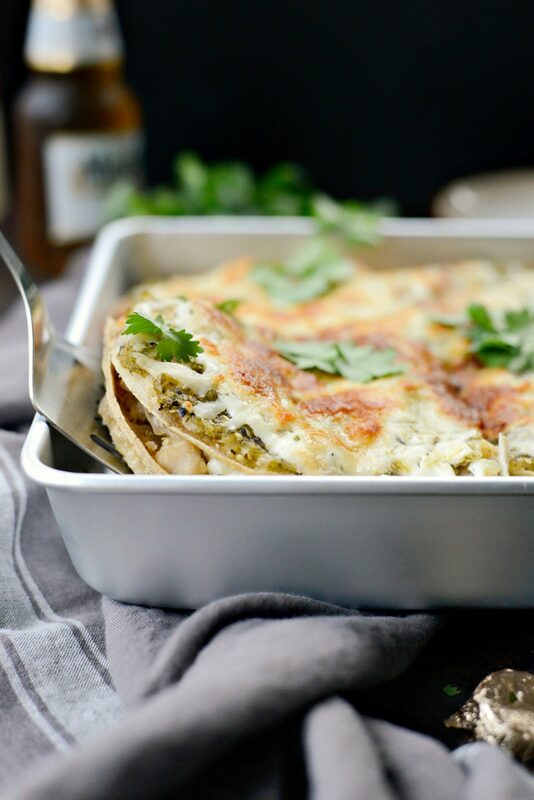 My entire family LOVES this recipe and I hope yours does too! Enjoy! 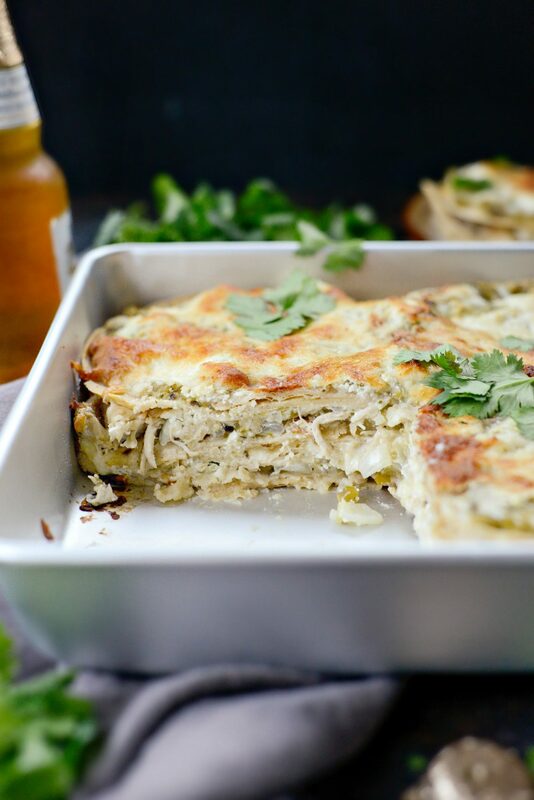 And if you give this Salsa Verde Chicken Tortilla Casserole recipe a try, let me know! Snap a photo and tag me on twitter or instagram! 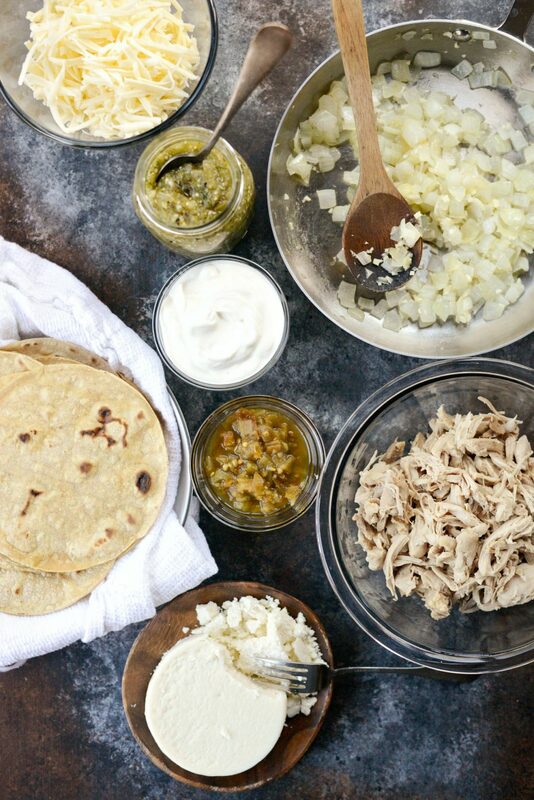 This Salsa Verde Chicken Tortilla has layers of corn tortillas, shredded chicken, cheese and a homemade salsa verde. Bake until hot and bubbly brown. Heat the oil in a skillet on medium-low and sauté onions until softened and translucent, about 8 minutes. Add in garlic and cook 1 to 2 minutes. 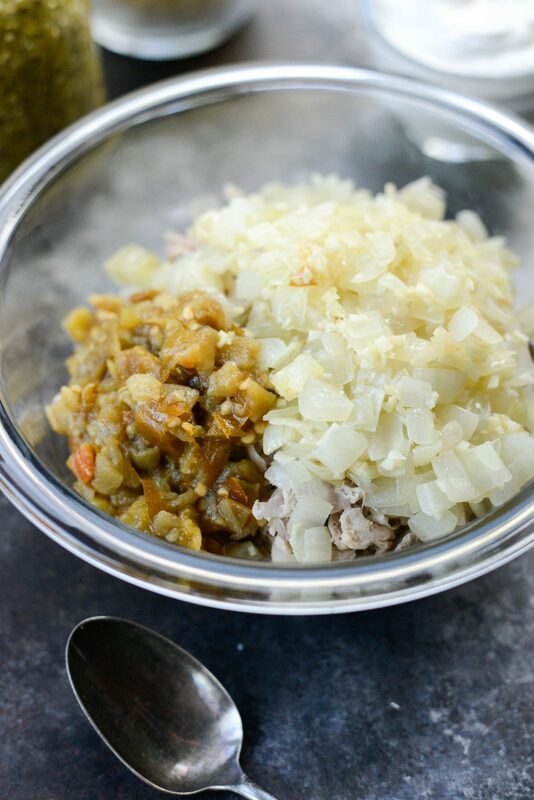 Then place the onions and garlic along with the green chiles into a bowl with the cooked and shredded chicken, stir to combine. 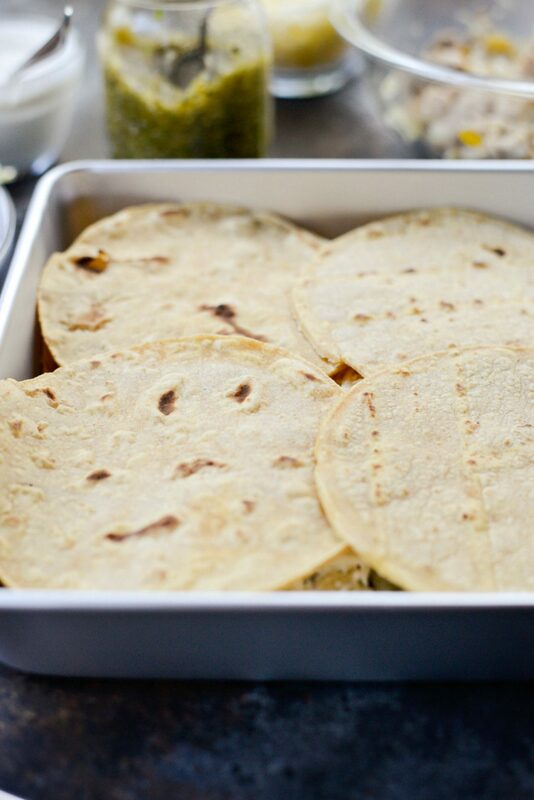 Place 4 toasted tortillas into the bottom of a 10x2 square metal pan (an 8x8 pan can be used if in a pinch, just overlap more). 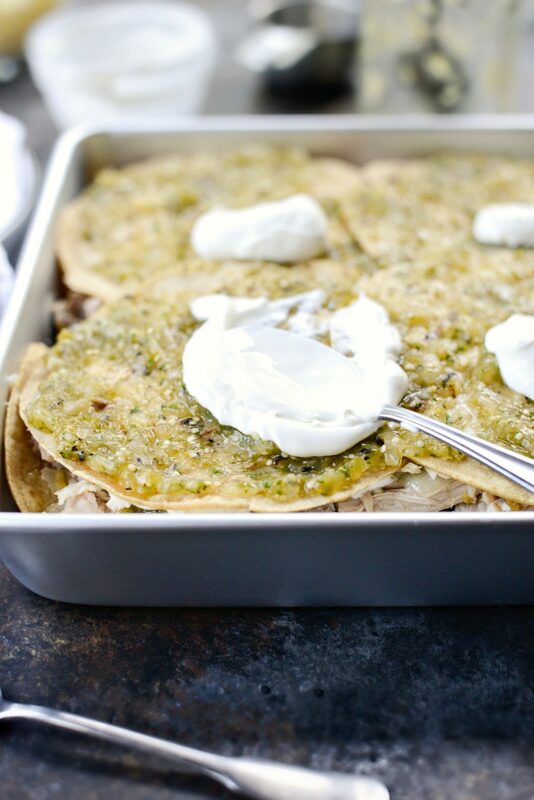 Spread half of the chicken/onion mixture on top of the tortillas, then 1/2 cup of salsa, 1/3 cup sour cream, 2 tablespoons cotija and 1/3 of the Monterey Jack cheese. 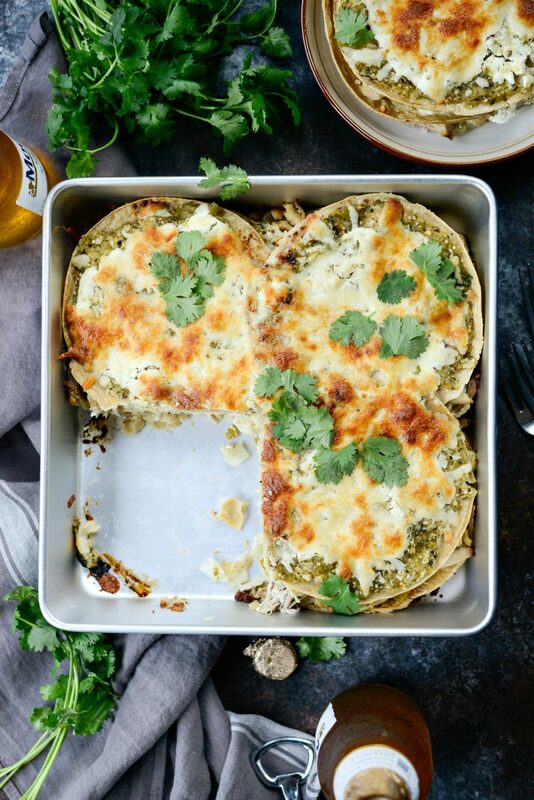 Repeat one more time; 4 more tortillas, the remaining chicken mixture, 1/2 cup salsa, 1/3 cup sour cream, 2 tablespoons cotija and half of the remaining Monterey Jack cheese. 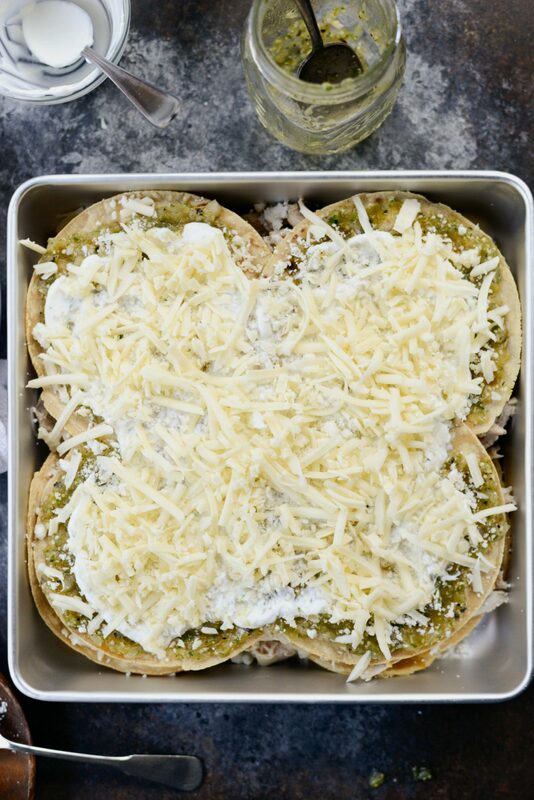 Then, for the last layer, place the remaining tortillas on top and spread the salsa and sour cream, then sprinkle with the last of the cotija and Monterey Jack cheese. Bake on the middle rack of your oven for 35 to 40 minutes or until the cheese is golden brown on top. 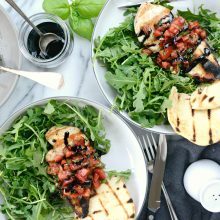 Serve with a scattering of fresh cilantro leaves. 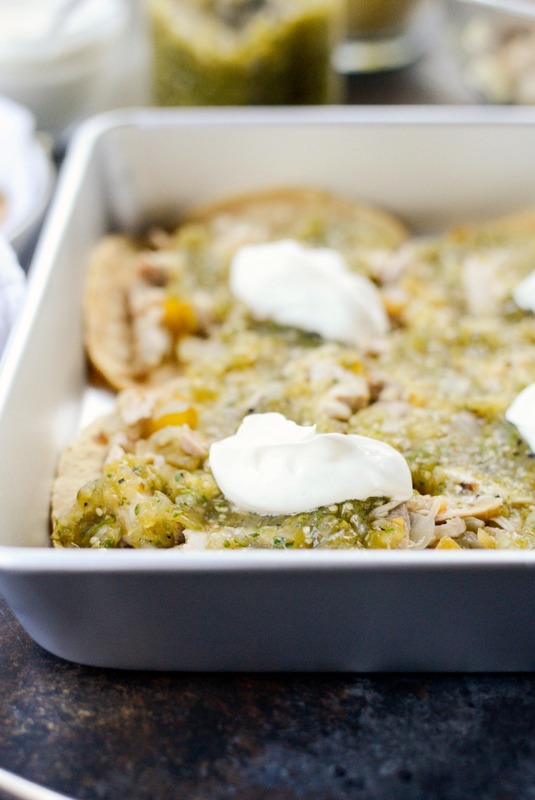 I cheated a little and didn’t make the salsa verde, but really enjoyed this recipe. My first time trying the Cotija cheese (and it was on sale at my supermarket.) Will definitely make this again. Thank you. I’m so glad you made it, Maria! And cotija is great on chili and tacos too! Thanks for another winner Laurie! 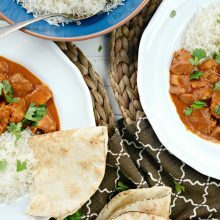 This was so delish and easy, the whole family loved it. I doubled it too, but hardly had any leftovers haha 😉 I also cheated/improvised…I had a couple of open packages of two different kinds of tortillas that I wanted to use up, I didn’t have the cojita so I used crumbled goat cheese (no one even noticed), and i used bottled salsa verde that I on hand. Just so good and savory. Thank you thank you!